With its predecessor a leading provider of white-label smartphone software services, Carota paid close attention to the need for OTA solutions with the advent of the connected smart car and has provided services to over 60,000 vehicles on the road after entering the market just three years ago. This year, the goal has been set at 500,000 units, necessitating collaboration with larger manufacturers. Recently, an incident has become a hot topic on the Internet in China when an electric vehicle came to a standstill in the middle of the Chang An Avenue for over an hour, attracting the attention of the police. However, the passengers could only sit there and look idly through the car windows, as even the windows could not be rolled down while the vehicle system went through an upgrade. The amusing scene reflects the importance of OTA to modern connected smart cars. Smart vehicles that can be connected to the internet are usually described as "smartphones with wheels". Yet, an increasing number of vehicles do not need to switch hardware, much like a smartphone. A software upgrade can only be completed through a download from the cloud, resulting in improved performance or new features. However, it is much more difficult to implement a full-vehicle OTA than a mobile phone, with Carota from Taiwan being one of the few companies on the market that are capable of providing automotive OTA services. The company, which was founded in 2018, has established partnerships with Geely, Dongfeng, WM Motor, Zhejiang Hozon New Energy and Luxgen, as well as several other car manufacturers. Last year, more than 60,000 cars adopted OTA technologies from Carota, while, this year, the number is expected to exceed 500,000 units. Generally, it often takes three to five years or even longer to get into the vehicle front fitting market, but Carota is an exception. Behind such excellent results is GMobi, the predecessor of Carota. Carota CEO Paul Wu founded GMobi in 2011 as a white-label smartphone application services provider in the emerging market offering cloud software updates, push advertising and payment flow services. With business expansion, the company developed into a leading white-label smartphone software service provider with more than 100 million users. In 2014, the company entered the IoT sector followed by IoV in 2015. Paul explained that the OTA function, which began with Tesla, has been clearly defined for smart automotive, saying, "It was actually Tesla who inspired us. By doing OTA well, vehicle owners can download their autopilot program "over the air", as well as the engine control unit (ECU) for different cars in order to add new features, just like a mobile phone can download a new app." Paul added that GMobi has provided many such services on mobile phones in the past and the experience can be extended to all kinds of smart devices, including cars. As a result, the company has more than seven years of experience in OTA technology despite Carota being a newly-established firm with a history of less a year. Paul also explained, "Small companies often have a very difficult time entering the auto industry and, if the manufacturers cannot quickly grasp what you are doing, you will be quickly knocked out." This is why they decided in 2018 to separate the IoT and automotive division from GMobi and use the name Carota, the combination of CAR and OTA in English. However, switching from mobile phones to the car market is more than just a change of name. Paul points out that cars are unlike a mobile phone which just has one operating system, either iOS, or Android, and most of the system upgrade conditions having been clearly defined. A car uses more than two hundred different ECUs. Steering wheels, brakes, dashboards, each component of the vehicle with a function has its own ECU. In addition to having different operating systems, different memory capacities and different in-car networks, each ECU will interact with each other. Compared to a smart vehicle, a smartphone is just like one of the components of a large system. "A vehicle upgrade is about a hundred times more complicated than a mobile phone upgrade," Paul said. Smartphone vendors would only lose money if they failed to upgrade smartphones but people would die if carmakers failed to upgrade cars. In addition, as manager of Industrial Technology Research Institute's Industrial Economics and Knowledge Center (IEK) Annie Shih said, the most important thing for OTA providers is that automakers would like to open the door to cooperation in support of subsequent data transfers. As a result, it is critical and also challenging for OTA providers to win the trust of automakers in addition to providing key technology capabilities. Paul said that strategically, Carota plans to work with automakers by forming relationships with ECU chip manufacturers and leading IoV system providers. The company had earlier established a partnership with Dongfeng Liuzhou Motor through its collaboration with the top international IoV solution provider Continental. "When working with Dongfeng Liuzhou Motor on an IoV project, Continental selected Carota as its OTA partner as Carota is one of the few vendors in China with both experience in implementing complete vehicle OTA technology and having strong support capability," stated Paul. "We have sent our professionals to Liuzhou to help Dongfeng Liuzhou Motor implement the technology. After over one year of working with the customer, we have gradually earned their trust through our professionals who worked in Liuzhou on-site seven days a week from 9 am to 9 pm." "Fortunately, we can convert the trust from our customers into a powerful strength although the journey of earning the trust is not easy." "We use security technology, which we are proud of, in combination with fast-response local services to serve car owners," added Paul. "With extensive experience in the domestic market, we are well positioned to become a global company that all Chinese would take pride in by expanding into North America, Europe, Northeast Asia and emerging markets." Based on its successful cooperation with several major carmakers, Carota is expected to easily gain recognition across the entire sector. Given the conformity effect that will emerge when an increasing number of vendors choose to collaborate with Carota, coupled with the difficulties in implementing OTA, automakers will likely rely on Carota once the partnership between them is established, bringing competitive advantages to the company. Carota is not the only pioneer entering the vehicle OTA market. In light of the increasing demand for the technology, a number of leading IoV system providers including HERE and Delphi have acquired OTA companies. Citing an example, Samsung, through the acquisition of Harman, obtained Red Bend which provides OTA platform services to Tesla. Clearly, Carota is neither the biggest nor the strongest player in the market in terms of its capital resources. Nevertheless, after three years of efforts, the company has achieved outstanding performance since 2018. Paul believes that Carota has built a competitive advantage in the domestic market. 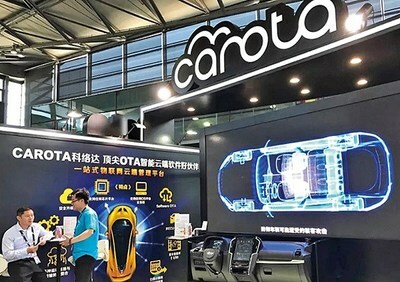 Unlike General Mobile Technology Co. which has had to seize opportunities in emerging markets outside China as it missed the opportunity to take the lead in entering the domestic smartphone market, it is the right time for Carota to make its foray into the vehicle OTA market. As PHI Capital partner Wang Yingming said, in China, vehicle OTA technology has not yet become the bloodied market where the competition is extremely fierce as the technology just emerged in the last two to three years. Given the increasing market demand for OTA but limited supply of the technology, Carota is preparing to take the opportunity to establish a presence in the world's largest single automotive market as a pioneer in OTA technology. Paul further explained that the percentage of cars with OTA functionality in China is currently extremely low but is growing rapidly. He believes that all new automobiles that will be produced in China three years hence, including low, medium and high-end models, will come with networking capabilities. In spite of the uncertainties that may exist in the Chinese automobile market in the next two years, he is still confident of the continuing rapid growth of Carota. After establishing partnerships with several Chinese-funded and Sino-foreign joint venture automakers, Carota has opened an office in Frankfurt, Germany in a move to work directly with German carmakers as part of its efforts to expand the business worldwide. Carota has developed additional OTA-based product lines while expanding into international markets. In particular, the company has launched two new products: Smart Diagnosis and Blockchain Safety Shield in addition to its basic cloud data transfer services. Smart Diagnosis is designed to detect the defects of vehicle ECUs by scanning the ECUs for the purpose of troubleshooting, allowing car vendors or maintenance facilities to make stock and production forecasts in advance. Blockchain Safety Shield enhances security protection based on blockchain and has entered the stage of conceptual validation. Paul said confidently that facing a future where everything is connected, Carota is already serving as the key gatekeeper in the automatic driving and 5G sectors. With an overwhelming advantage in complete vehicle OTA technology, Carota plans to support carmakers' strategy for the next century throughout the full vehicle lifecycle from research and development to aftersale services, unlocking the unlimited potential of smart cars. Founded in 2011, Carota was jointly funded by MediaTek, SingTel, Trend Micro, Arm China and CID Group. With leading multinational management and R&D teams, the company encourages scientific and technological innovation as part of its corporate philosophy and continues to invest heavily in R&D that delivers best-in-class products and technologies, as well as reliable, stable, secure, scalable and efficient cutting-edge OTA solutions. The company provides professional customized services to meet the growing demand for OTA upgrade services for connected vehicles and IoT developers, providing a path for vehicles to always be equipped with leading technologies that enable remote upgrades of smart IoV. Carota's integrated one-stop OTA technology is the best partner for IoV and IoT when upgrading intelligent cloud software.